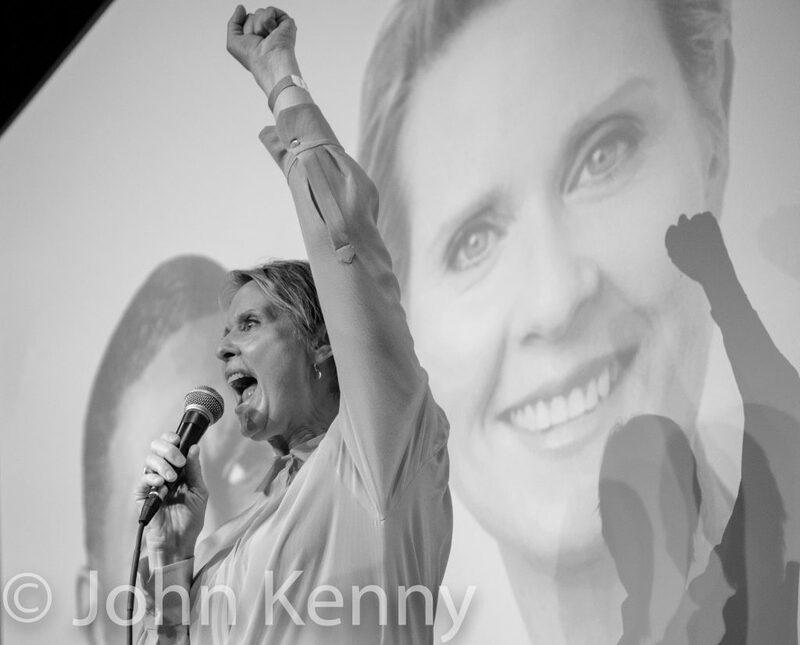 Democratic candidates Cynthia Nixon, Jumaane Williams and Zephyr Teachout held a final GOTV rally on the night before the Democratic primary, seeking to get their voters out on primary day. Our full photo gallery is available here. 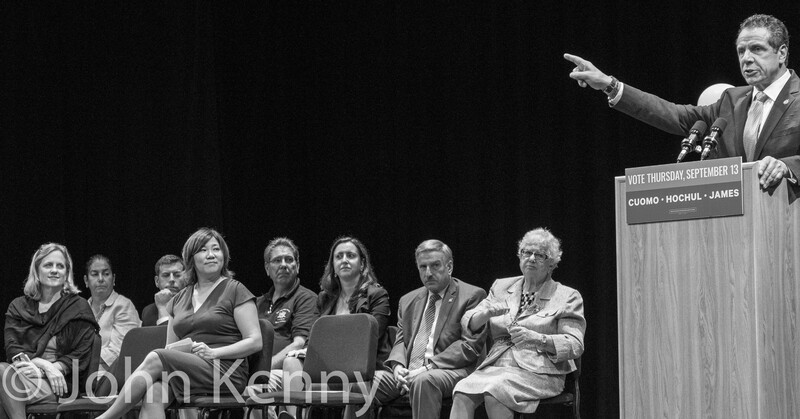 Governor Andrew Cuomo held an unannounced rally in Flushing on primary eve, joined by eight Queens elected Democrats. 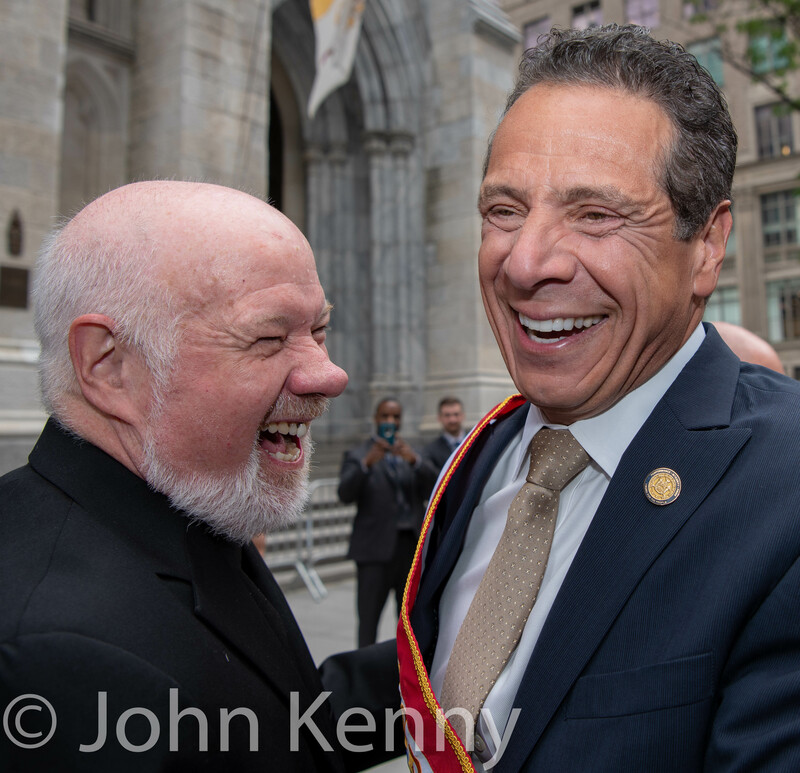 One of approximately a half dozen unannounced Cuomo appearances that day, the rally was “closed press,” but the Cuomo campaign relented and allowed press to enter and cover the rally. Lt. Gov. Kathy Hochul and attorney general candidate Tish James also appeared at the rally, although after Governor Cuomo’s quick departure. Lt. Gov. 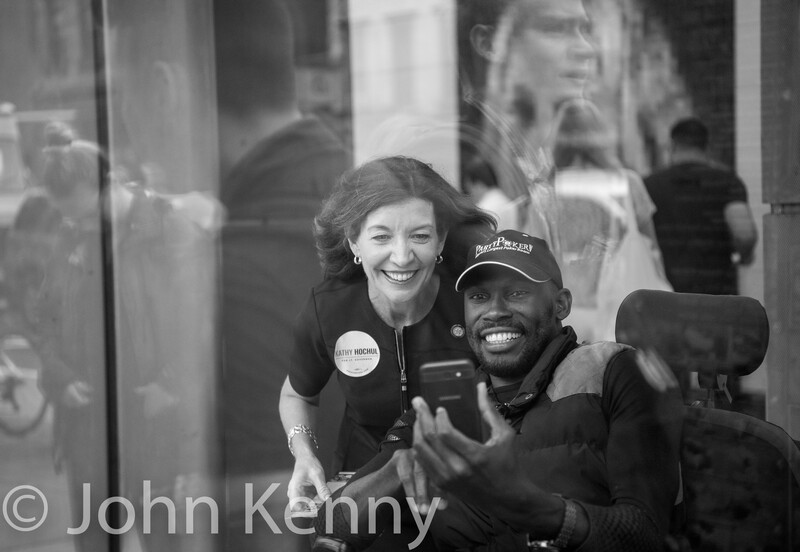 Kathy Hochul made an unannounced appearance outside the Second Avenue subway, greeting commuters at 83rd Street and Second Avenue on the day before the Democratic primary. She was joined for part of her appearance by Assembly Member Rebecca Seawright. 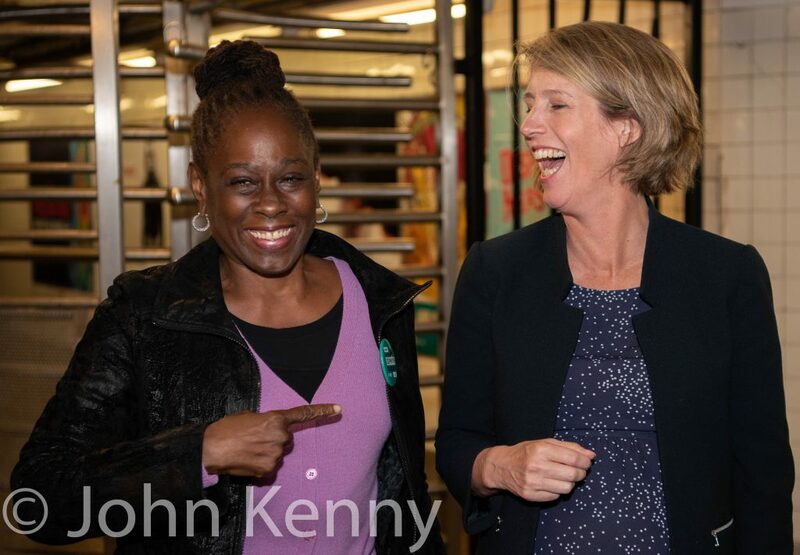 Chirlane McCray, wife of Mayor Bill de Blasio, endorsed and appeared with attorney general candidate Zephyr Teachout. They appeared together at a Brooklyn subway station just before Teachout’s four-way primary. Teachout is the first candidate endorsed by McCray in the 2018 Democratic primaries, and McCray said that she does not plan to endorse any other candidates in the primaries. 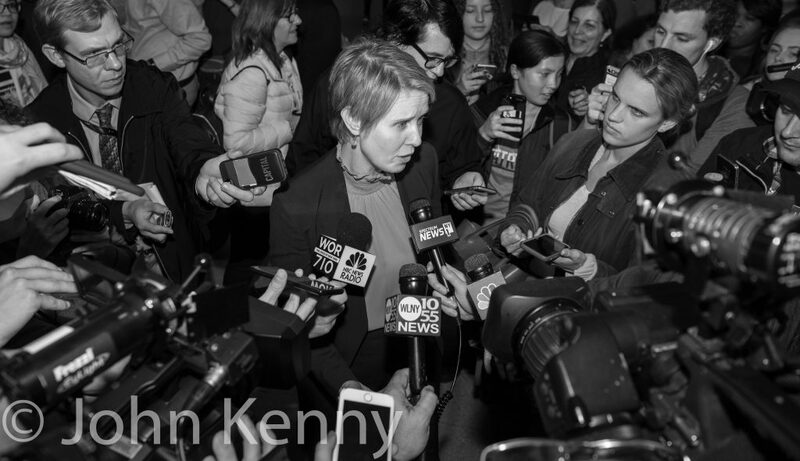 Democratic gubernatorial candidate Cynthia Nixon made a rush hour appearance at Manhattan’s Grand Central Terminal, drawing a crush of press and fans amid the stream of evening commuters. 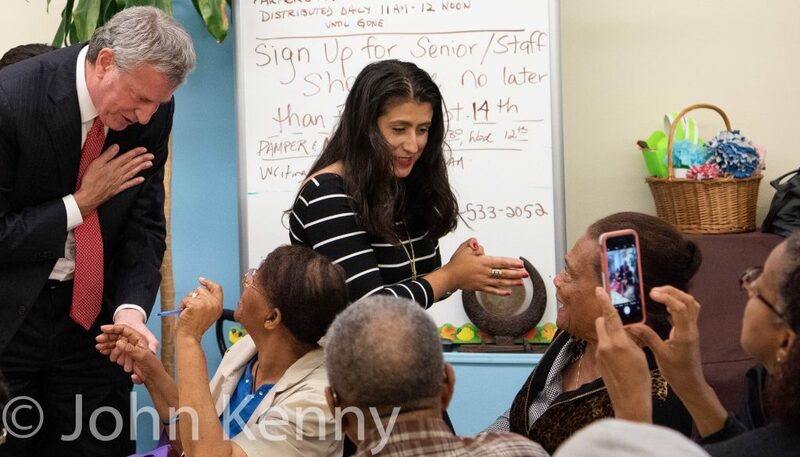 Mayor Bill de Blasio continued his energetic support for state senate candidate Jessica Ramos, joining her for a visit to a senior center in East Elmhurst. de Blasio has limited his public endorsements in the 2018 primaries to just a few candidates, with Ramos at the top of his list. 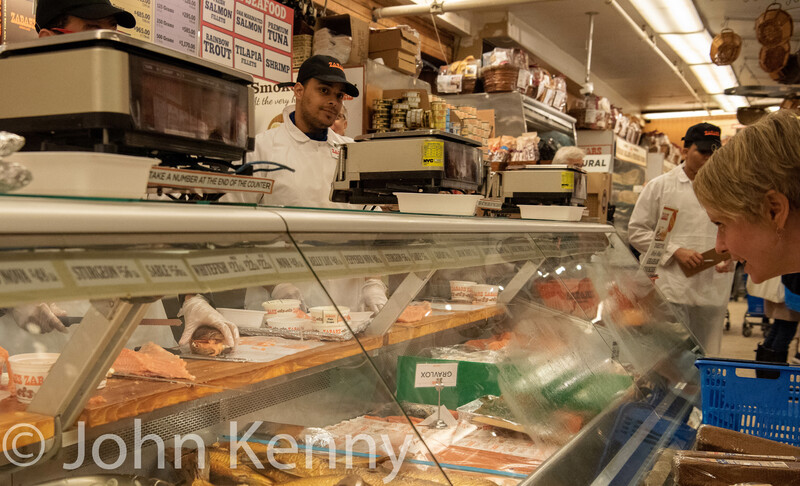 Democratic gubernatorial candidate Cynthia Nixon appeared outside Zabar’s, greeting shoppers and passersby just before the start of Rosh Hashanah. Midway through her appearance she headed inside, ordering an unusual sandwich that roiled the internet. 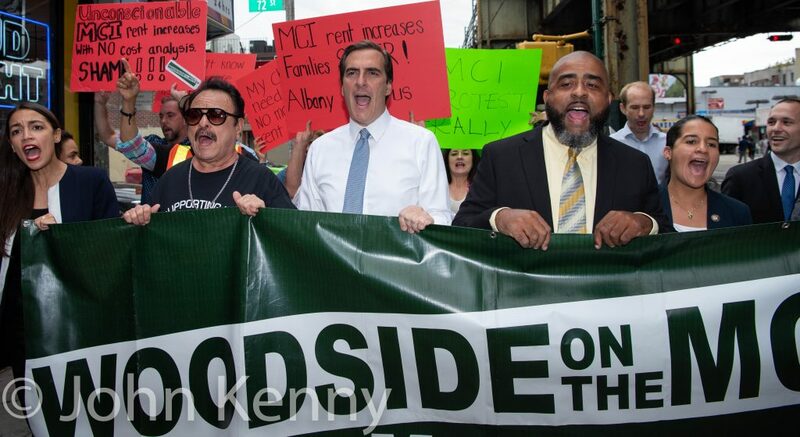 Housing activists organized a march and rally protesting the inclusion of the costs of major capital improvements, or “MCIs,” in calculating rent increases for rent-stabilized and controlled apartments. The march started in Jackson Heights and went to offices of a landlord at 49th Street and 47th Avenue in Woodside. The march attracted competing local politicians including Jose Peralta and Jessica Ramos, competing for a state senate seat, and Ari Espinal and Catalina Cruz, competing for a state assembly seat. 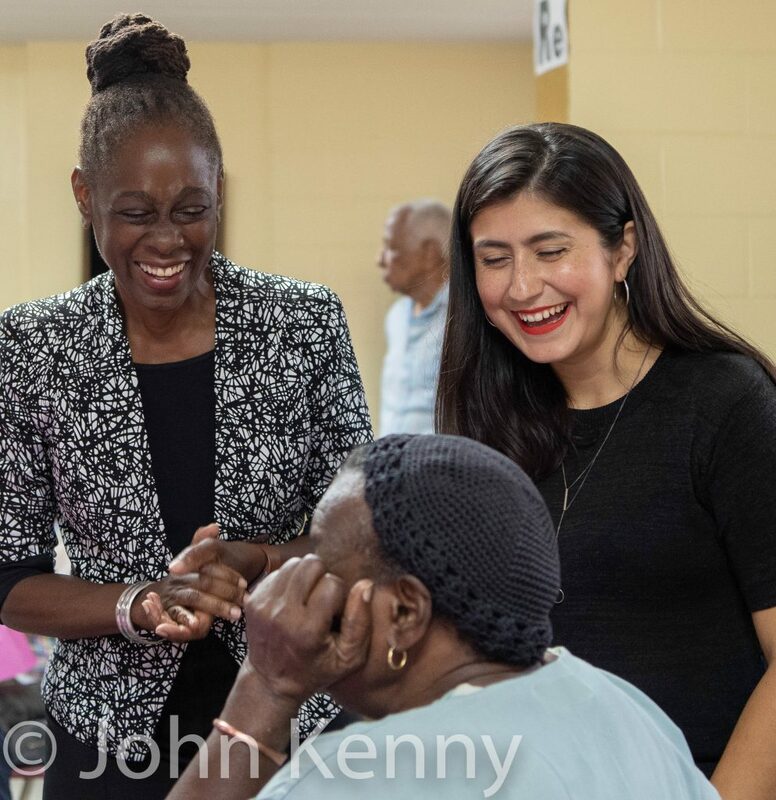 Alexandria Ocasio-Cortez, the Democratic congressional candidate who defeated incumbent Rep. Joe Crowley in June, also participated. 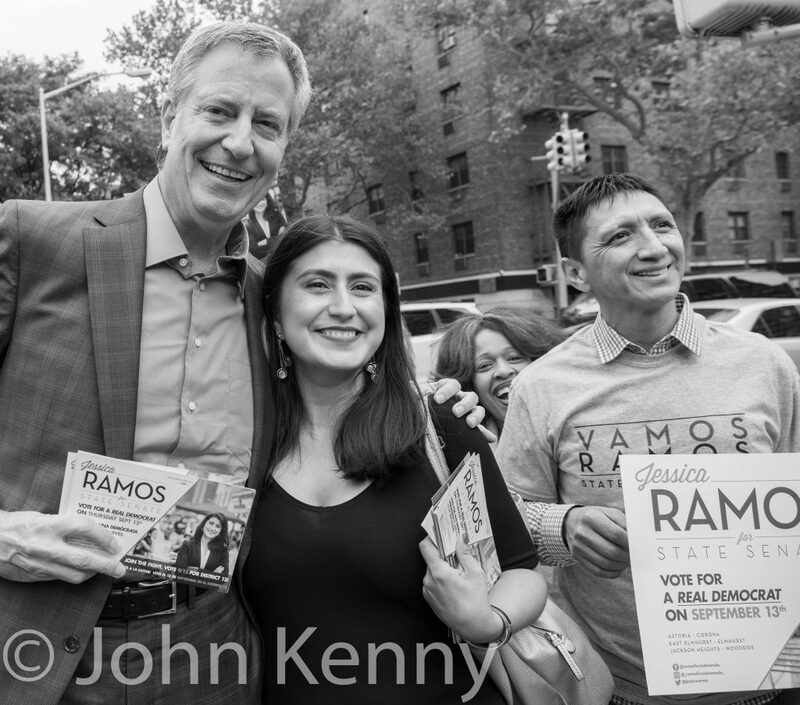 Mayor Bill de Blasio energetically embraced state senate candidate Jessica Ramos, campaigning with her in LeFrak City. Ramos, a former staffer for de Blasio, challenge incumbent and former IDC member Jose Peralta. 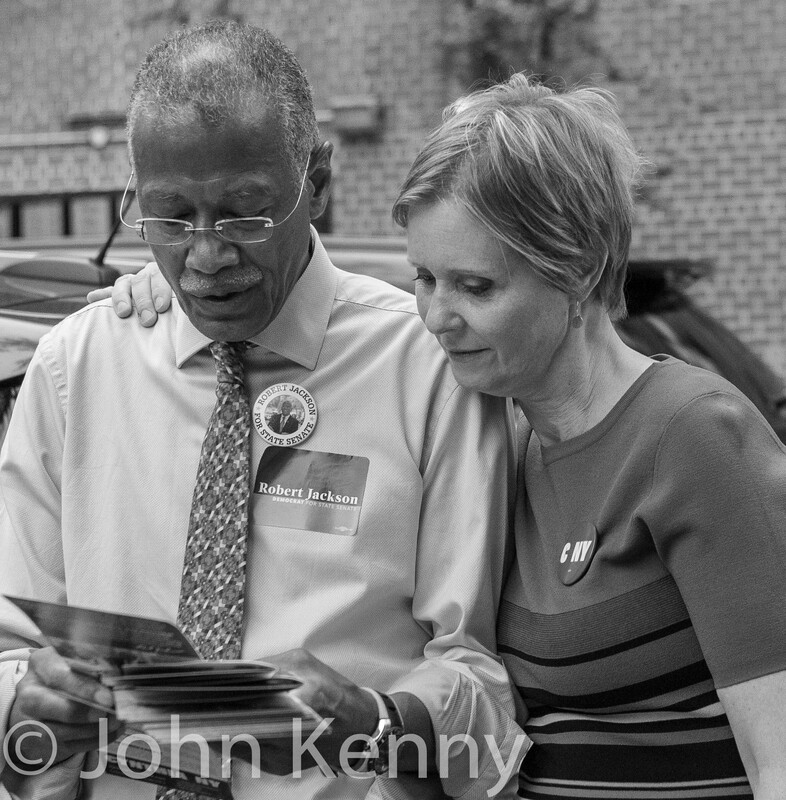 Gubernatorial candidate Cynthia Nixon and State Senate candidate Robert Jackson campaigned together on the Upper West Side, appearing outside P.S. 75. P.S. 75 was Nixon’s first school and lies in the senate district that Jackson seeks to represent. The 2018 Labor Day Parade drew a large number of elected officials. 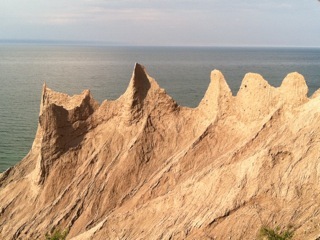 Our full photo gallery is available here. 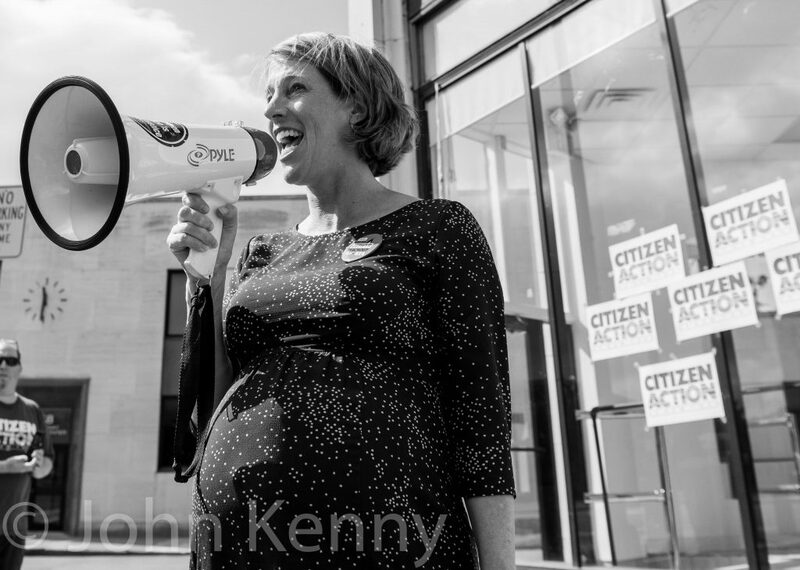 Democratic candidate for attorney general Zephyr Teachout and Democratic candidate for governor Cynthia Nixon appeared at a GOTV rally in Kingston. 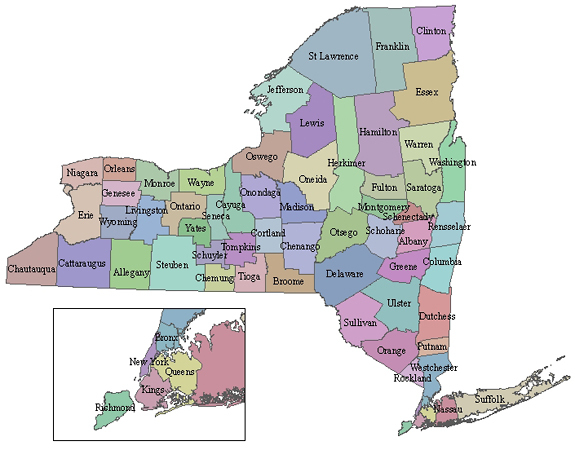 The two candidates were winding up a three day upstate campaign swing, but appeared in Kingston about 20 minutes apart.